THOUGHTSKOTO Thoughtskoto : Bigamous Marriage Is Void- Do You Still Need To File Annulment? 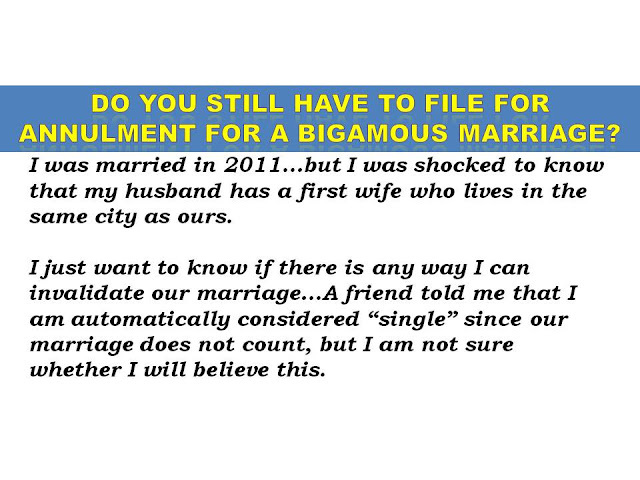 Bigamous Marriage Is Void- Do You Still Need To File Annulment? Marriage is a contractual union between a man and a woman. However, there are some instances where marriage can be classified as void or not valid from the beginning, One example is marriage that is bigamous or one of the party has been previously married and then he or she entered into another marriage even when the first or previous marriage has not been legally dissolved or annuled. The drama below is one simple example and portrayal of a bigamous marriage. 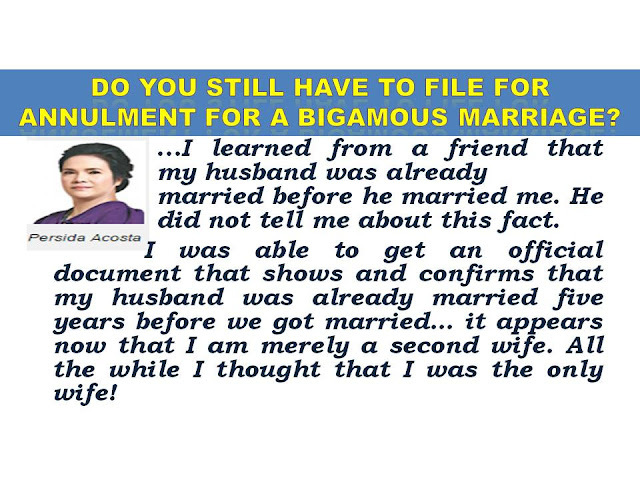 It is important to know that bigamous marriage is rendered void in court . Although this maybe the case, most often, there are still legal records that needed to be cleared so the person could move on with his or her life. You might want to check with your divorse lawyers how you should go about the filing of Petition For Declaration of Nullity of Marriage as there are procedures and documents that needed to be prepared before you could file this. Or you may visit the Public Attorneys Office (PAO) for help or assistance on your case. Clearly, a person convicted of the crime of bigamy shall suffer the penalty of prision mayor or imprisonment for six years and one day to twelve years. Who may file case for bigamy? “It is settled that in bigamy, both the first and the second spouses may be the offended parties depending on the circumstances” (Garcia vs. Court of Appeals, G.R. No. 119063 January 27, 1997). According to Atty. 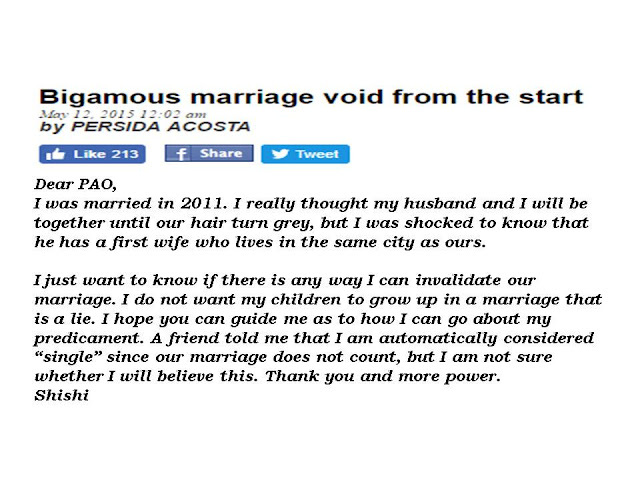 Persida Acosta, "It is immaterial therefore that you turned out to be the second wife. What is material in your situation is the existence of the elements of the crime of bigamy and that you as the offended party, did not know that your husband was already married to another person at the time you were married. 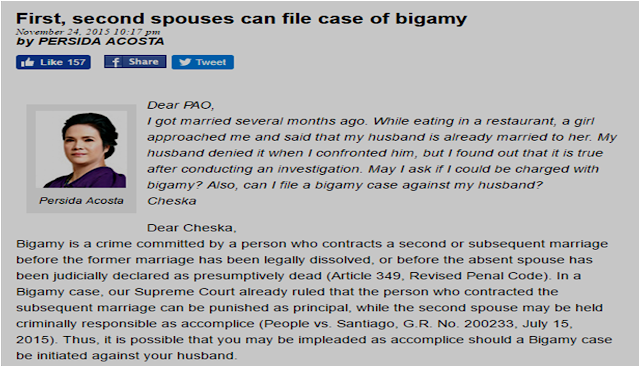 Therefore, you may file the appropriate criminal complaint for bigamy against your own husband." Does annulment of first marriage absolves a person who committed bigamy?